Harley-Davidson Inc. (NYSE: HOG) is scheduled to release its fourth quarter earnings for 2009 before the market open on Friday, January 22, 2010. Analysts, on average, expect the company to report a loss of 29 cents per share on revenue of $766.14 million. In the year ago period, the company reported earnings of 34 cents per share on revenue of $1.29 billion. 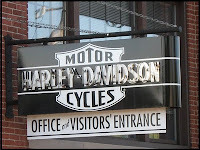 Harley-Davidson, Inc., through its subsidiaries, produces heavyweight motorcycles, as well as offers motorcycle parts, accessories, and related services. It operates in two segments, Motorcycles and Related Products, and Financial Services. Harleys continue to be largely recreational luxury vehicles not typically used as a primary method of transport. The vast majority of customers are essentially middle-aged, middle to upper class males. The average age of a Harley owner is 47 years. The major problem for Harley is that these older riders are not being replaced by a fresh batch of younger riders. Harley Davidson suffered a steep drop in motorcycles sales last year due to a severe recession characterized by contracting credit market and uncertain job market. The company's expensive motorcycles have failed to attract buyers amid weak spending environment. Additionally, the second hand motorcycle market is flooded with Harleys as cash strapped Harley owners look to unload their bikes for cash.Harley-Davidson's finance unit, better known as Harley Davidson Financial Services or HDFS was greatly affected by the credit crunch as the secondary market for Harley loans vanished.The finnce arm's performance has also been affected by heightened competition. HDFS retail market share of new Harley-Davidson motorcycles sold in the US was 51.2% in the third quarter of 2009 compared to 57.6% in the third quarter of 2008. In October, the Milwaukee, Wisconsin-based company reported that its third-quarter net income plunged 84.1% to $26.5 million, from the previous year's $166.5 million. On a per share basis, earnings plummeted 84.5% to $0.11 from $0.71 earned in the year-ago quarter. Analysts, on average, expected the company to post earnings of $0.21 per share on revenue of $1.10 billion for the quarter. The company said in October that it would discontinue its Buell product line and divest its MV Agusta nit, as part of its go-forward business strategy designed to strengthen Harley-Davidson for long-term growth and deliver results through increased focus. However, the decision of the company was criticized by many as the move will potentially remove an entry point into the Harley family for the youngsters. The company also said that it would continue to expand its initiatives to enhance profitability through continuous improvement in manufacturing, product development and business operations.On a combined basis, Harley-Davidson expects its restructuring activities, together with the discontinuation of Buell operations, to result in one-time charges of $215 million - $245 million over 2009 and 2010, or an increase of $55 million from the estimate provided July 16, 2009. The company estimates annual ongoing savings from restructuring of about $140 million to $150 million. The company also narrowed its fiscal 2009 guidance for shipments, and now expects to ship 222,000 to 227,000 Harley-Davidson motorcycles to dealers, including 35,000 to 40,000 during the fourth quarter. The company continues to expect full-year gross margins to be between 30.5% and 31.5%. Last month, the motorcycle manufacturer issued a recall on its 2009 & 2010 touring line made between June 6, 2008, and Nov. 19, 2009, which consists of 111,569 motorcycles in total. The recall was due to concerns over the fuel tank mounts on these motorcycles, which might distort in a collision, possibly leaking fuel, and thus causing a fire. Harley-Davidson recently announced that it plans to introduce 12 models to the Indian market in 2010. Agreed, India is the world's largest market for motorcycles behind China- but it is doubtful that they will be extremely profitable. The average price of the motorcycles sold in India is in the $1000 to $1500 range. The country slapped over 100% tariff on HOG. The cheapest bike they will sell there will be a normally about $7000 bike, which will retail for over $14000 due to the tariff. It's hard to imagine many Indians wanting to pay this kind of premium price. The company's stock currently trades at a forward P/E (fye 31-Dec-10) of 20.22 and PEG ratio (5 yr expected) of 5.45. In terms of stock performance, Harley-Davidson shares have gained nearly 90% over the past year.